Extend your WaveRV antenna cable! The Radiolabs USB16GOLD Active Extension Cable is an easy way to extend the USB cable length on your WaveRv, WaveRv Marine or any other USB powered device. The USB16GOLD can extend your USB cable length up to 16 feet and still power your USB 1.1 or 2.0 device! All you have to do is plug the USB16GOLD's connector into the cable from your device and plug the other end into your computer's USB port. There is no setup and no software needed! 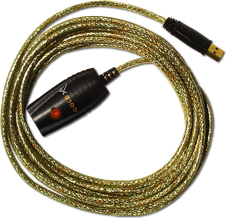 The USB16GOLD Active Extension Cable is the quickest and easiest way to extend your USB cable. Dimensions 16' foot long, standard Type A x active end 1.125"
Weight 1 lb. 14 oz.